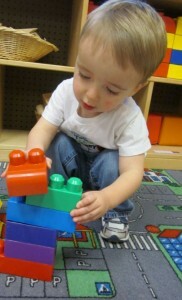 These activities are great to do with a two year old! Get down on the floor with your two year old and bring out the stuffed animals, and brushes and combs. Tell your child that their animals need to be brushed and cared for. How does your child react? Does she pick up stuffed animal? Does he try using the comb or brush on his skin or hair? Ask him how it feels to use the brush on his arm. Give him words like, “I bet that feels soft on your arm.” Does he try and use the comb or brush on some animals? Is your child brushing the same stuffed animal as you are? Put silly ribbons or clips in the animals’ hair. Does your child think that is funny? Does she want to try doing that too? Continue as long as your child is interested. Help your child look for animal or human pictures from magazines that show funny faces and cut them out. You can attach them to pieces of heavy paper or cardboard if you want, but you don’t need to. Hold up each picture and encourage your child to pretend to be that human animal. Mimic the expression. Name the feeling that goes with the face. Have fun and join your child in moving or acting like the animal or person also.